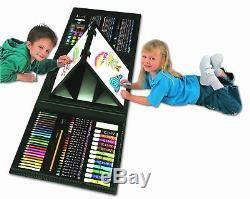 Art Set For Kids Child Crafts Organized Case Trifold Easel 179-Piece Paint Color. Have fun and learn with Art 101. The Art 101 179Pc double sided trifold easel art set comes with 48 crayons, 48 oil pastels, 24 color pencils, 18 watercolors, 12 markers, 10 sheets of paper, 4 large clips, 3 paper clips, 1 Art 101 painting and drawing guide, 1 sketch pencil, 1 paint brush, 1 ruler, 1 eraser, 1 color wheel, 1 palette, 1 pencil sharpener, 1 white watercolor and 1 sponge with a double sided easel in a trifold organizer case. We have created our learning guides in partnership with the art Institute to teach basic painting and drawing techniques. 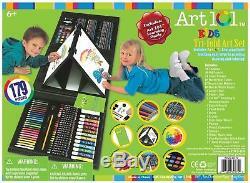 Art 101 tri- fold art set lets youngsters draw, paint and color to their arts content! Oil pastels, watercolors, crayons, colored pencils, paper and more, ready to go in a neatly organized case, so your budding artist can create their masterpiece anywhere! Supplies: 48 crayons; 48 oil pastels; 24 colored pencils; 18 watercolors; 12 markers; 10 sheets of paper; 4 large clips; 3 paper clips; sketch pencil; paint brush; ruler; eraser; color wheel; palette; pencil sharpener; sponge; Art 101 painting and drawing guide; tri-fold organizer case with double-sided easel. For ages 6 and up. The picture-perfect gift for the young artist! Not for children under 3 yrs. The Art 101 179pc Double Sided Trifold Easel Art Set comes with 48 crayons, 48 oil pastels, 24 color pencils, 19 watercolors, 12 markers, 10 sheets of paper, 4 large clips, 3 paper clips, 1 Art 101 Painting and Drawing Guide, 1 sketch pencil, 1 paint brush, 1 ruler, 1 eraser, 1 color wheel, 1 palette, 1 pencil sharpener, and 1 sponge with a double sided easel in a trifold organizer case. We have created our learning guides in partnership with the Art Institute to teach basic painting and drawing techniques. Comes with a variety of art components. Great set for any level of artist. Bright and colorful to inspire kids creative side. Product Dimensions: 12.2 x 2.5 x 16 inches. Item Weight: 3.3 pounds. We are a clearinghouse of major retailers. There they process and forward your item to the provided address. Our electronic products are manufactured according to the specifications of the US Electrical Standards and Codes. We assume no responsibility if the items malfunction or cause an accident because one tried to use the product with foreign electrical standards. The use of a converter or other voltage transforming device is at your own risk. We will guide you and give you the instructions. The item "Art Set For Kids Child Crafts Organized Case Trifold Easel 179-Piece Paint Color" is in sale since Sunday, October 22, 2017. This item is in the category "Crafts\Art Supplies\Drawing & Lettering Supplies\Other Drawing Supplies". The seller is "martha_247" and is located in Fairfax, Virginia. This item can be shipped to United States, United Kingdom, Denmark, Romania, Slovakia, Bulgaria, Czech republic, Finland, Hungary, Latvia, Lithuania, Malta, Estonia, Australia, Greece, Portugal, Cyprus, Slovenia, Japan, China, Sweden, South Korea, Indonesia, Taiwan, South africa, Thailand, Belgium, France, Hong Kong, Ireland, Netherlands, Poland, Spain, Italy, Germany, Austria, Russian federation, Israel, Mexico, New Zealand, Philippines, Singapore, Switzerland, Norway, Saudi arabia, Ukraine, United arab emirates, Qatar, Kuwait, Bahrain, Croatia, Malaysia, Brazil, Chile, Colombia, Costa rica, Dominican republic, Panama, Trinidad and tobago, Guatemala, El salvador, Honduras, Jamaica, Antigua and barbuda, Aruba, Belize, Dominica, Grenada, Saint kitts and nevis, Saint lucia, Montserrat, Turks and caicos islands, Barbados, Bangladesh, Bermuda, Brunei darussalam, Bolivia, Ecuador, Egypt, French guiana, Guernsey, Gibraltar, Guadeloupe, Iceland, Jersey, Jordan, Cambodia, Cayman islands, Liechtenstein, Sri lanka, Luxembourg, Monaco, Macao, Martinique, Maldives, Nicaragua, Oman, Peru, Pakistan, Paraguay, Reunion.